Catch 21 is a casual & healthy seafood/BBQ grill that has all types of seafood and healthy salads. Not everything is healthy, they have fried fish, french fries and calamari lol, but they have tons of healthy options. Not everything is seafood either, they have BBQ options of chicken and pork ribs too, but if you like fish and feel like something healthy for lunch or dinner, they have all types of different fish you can get in different ways. 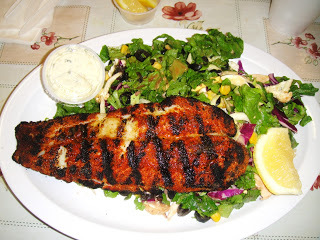 I love seabass, so I ordered blackened/cajun seabass on top of salad with balsamic dressing. You make your own salad, and they give you a pretty generous portion. The seabass was fresh with lots of flavor. It’s good “fast” food for a good price. Catch 21 seems like a great place to dine! It’s hard to find a casual dining restaurant that serves healthy seafood that isn’t fried. I also really like how you can make your own salad…I hate having to give special orders when I go out to eat!